← Contradictions in the Bahai Faith! Where is Abbas Effendi’s certificate of British Knighthood?? As those who know about modern knighthoods by the British crown, every knighthood is for a specific reason; such reasons always being explicitly spelled out in the Certificate of Knighthood. 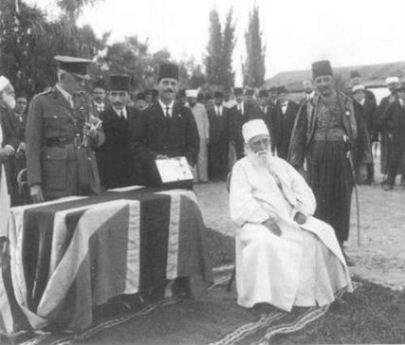 Over the past 87 years we have been repeatedly shown the picture of Abbas Effendi’s knighting ceremony in April 1920, but never have we been shown the actual certificate of Knighthood itself which explicitly spells outthe reasons for the knighting. Among other things, over the past several years, through various contacts, I have been deliberating over facsimiles of local archival material related to the Acre-Haifa areas of the Ottoman period of the Young Turks, the British Palestinian mandate years of 1917-1948 and Israeli material for the years 1948-57, all relating to the activities of the Nuri family in that area. Thankfully, I have been paid for this job by certain unamed private and well endowed employers/independent contractors, which has allowed me time to write and publish a book (work on 8 more) as well as conduct a war against the haifan Bahai organization. Specifically I have looked at deeds of property (sales,notaries, taxes etc) and what have you in the Acre-Haifa areas. But especially I have looked at zeroing in on material specifically relating to the contention in Bahai histories regarding the nature of Abbas Effendi’s so-called humanitarian activities during the Palestinian war years of 1915-1917 in order to determine the precise nature of such activities. Over 50,000+ pages alone of archival documentation and sources has been looked at specifically for the years 1910-1917 (i.e. the years of the Young Turk Ottoman period). To date, whether they be files by public notary or police files, there is not a single leaf of evidence (whether circumstantial or otherwise)remotely establishing the Bahai claim that Abbas Effendi was engaging in humanitarian activities during the Palestinain war years of1915-1917. Add to that the fact that the actual certificate of Abbas Effendi’s Knighthood has not been publicly seen since 1920 nor has it been published, and the issue of Abbas Effendi’s knighthood becomes anothers uspicious enigma much like his purported (and largely fictitious) will and testament. As stated, the reason for this is obvious: all Certificate of Knighthood spell out the reasons for the Knighthood. It appears that the Bahai establishment is somewhat uneasy to disclose the true nature of Abbas Effendi’s Knighthood and so have hidden this document from public scrutiny. But, that stated, the Knighthood had absolutely nothing to do in fact with any so-called humanitarian activities on his part. Had it been, plenty of local archival material would have corroborated it, and the certificate of knighthood would have been released for display and public scrutiny long ago. Another Bahai myth busted!